Stewart Wingate is a chartered engineer and has been chief executive of Gatwick Airport since 2009. 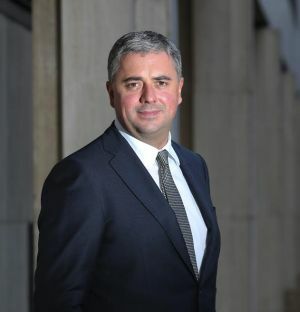 He was customer services director of Glasgow Airport (2004-2005), chief executive officer of Budapest Airport (2005-2007) and, prior to the purchase of Gatwick by a group headed by Global Infrastructure Partners, managing director of Stansted Airport (2007-2009). He has a Master’s degree in Business Administration. Last Thursday, I was able to congratulate Norwegian on its announcement that Singapore is to join Hong Kong, the other major city state hub airport in the Far East, with non-stop flights from Gatwick in the autumn. However, it is not so much of a breakthrough but the consolidation of the new long-haul routes we have been able to welcome so far this this year, joining Xian, starting in June, plus Denver and Seattle in September. As we prepare for what will be the busiest summer in our history, Gatwick is clearly booming as our passengers continue to show confidence in our offering, particularly to the growing number of long-haul destinations that Gatwick now serves. A lot of work has gone into preparing for the record-breaking summer so that we can continue to provide the most enjoyable, safest, and most secure experience possible for the millions of passengers that will travel with us this year. Earlier this year, we worked with easyJet, Virgin and British Airways on one of the most complex projects Gatwick has ever undertaken. Following two years of planning, easyJet in January consolidated all its operations in the North Terminal, Virgin switched operations from the South to the North, and British Airways vice versa. It was a huge and complex undertaking but also a seamless and unqualified success thanks to meticulous planning with close and productive working between the airlines and the airport. This hard work has directly benefited our passengers. The latest results from our research show that passengers’ positive attitudes toward Gatwick have reached record high levels – they tell us that they like Gatwick for being easy to travel through. Since investing in improvements to security, check-in facilities, and through the airline moves project, the flow of passengers has been improved further. This is even more important when you consider that we have just hit 44m passengers a year – a world record for a single-runway airport and a mark that some predicted we would not hit until 2035. This growth has been spurred by our fast-growing long-haul network. Both Denver and Seattle are top destinations for leisure and business travellers and, crucially, both cities are prominent business centres known for their hi-tech and advanced manufacturing industries. Xian is the most populous city in northwest China, with 13.5m living in the metropolitan area. Our new route to Singapore – linking as it does two of the world's top three financial centres – will be welcome news for business travellers, particularly at a time when global trade is increasingly important for the UK economy. These important destinations are welcome additions to our long-haul network, which includes significant connections to Canada and the US, Hong Kong and three new links with China with Tianjin. I’m delighted that our airlines have responded to demand for long-haul services and added such premier destinations to our growing long-haul network. As our global route network expands, so too does Gatwick’s reputation on the global stage as a growing option for international travel. We look forward to more announcements as we grow our network further with more connections with Asia. As we grow and set new records, we note that, of the top 10 European airports by passenger number, Gatwick is the only airport with just one runway. At this crucial time for the country and the economy, Gatwick continues to stand ready and offers the UK government a credible and deliverable option for runway expansion. How much did LGW spend on PR lobbying versus LHR? Is it true that an aborted takeoff could cut power lines? We acknowledge that aircraft noise is a matter of concern and we strive to strike a balance between continued growth and the needs of local communities. A substantial amount of work has been undertaken and real progress made by Gatwick, industry stakeholders and local communities through our new independent Noise Management Board. There is still some way to go and we will continue to address fresh areas of concern. This has been an extremely constructive process and the establishment of the Noise Management Board has been particularly groundbreaking and it will lead to continued improvement in the airport’s noise performance. Sadly Mr Wingate forgets to mention the growing problems he has with noise. Gatwick is not a good neighbour and the long haul additions have been removing the winter respite that residents have come to expect. It is a shame that Gatwick's CEO continues to put profits before people trading off low cost carriers who pay no VAT or duty and thus do not compete in a level playing field like other industries. Once we are removed from the EU there is nothing to stop boosting the UK economy by making aviation pay and reducing the environmental impact Gatwick's low cost leisure airlines have on those close to Gatwick and the planet.